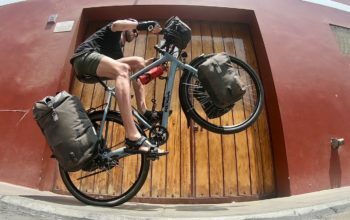 I’ve been on the hunt for the perfect tent for some time, with the intention of taking it on my two-year bike tour: CyclingAbout The Americas. Having used dozens of tents over the years, I feel like I’m getting closer to a tent that is suitable for my needs. 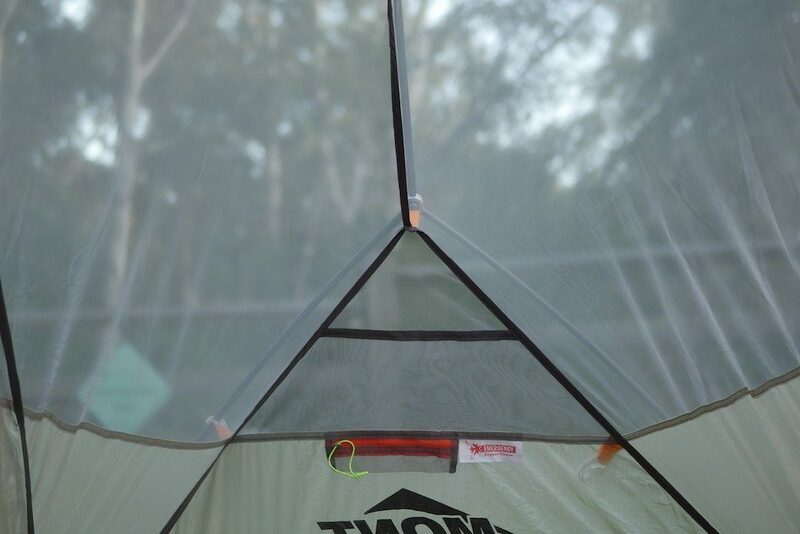 This will be an in-depth Mont Moondance tent review, offering a tour of all of the features, as well as my thoughts after six months with the tent. 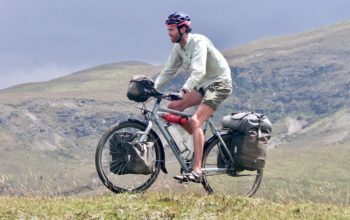 Note: I discuss these characteristics in more detail in my resource about buying a bicycle touring tent. 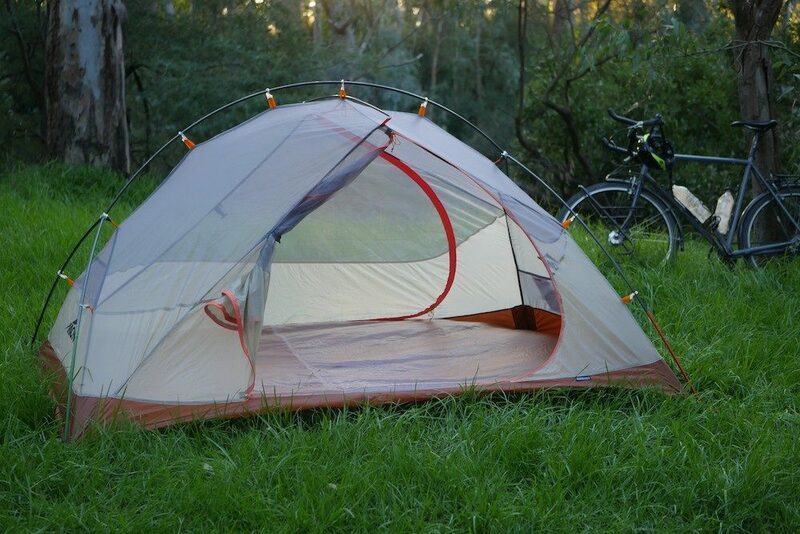 The Mont tent including the inner, fly, poles, pegs and guy ropes weighs 1.93kg (4.25lbs). 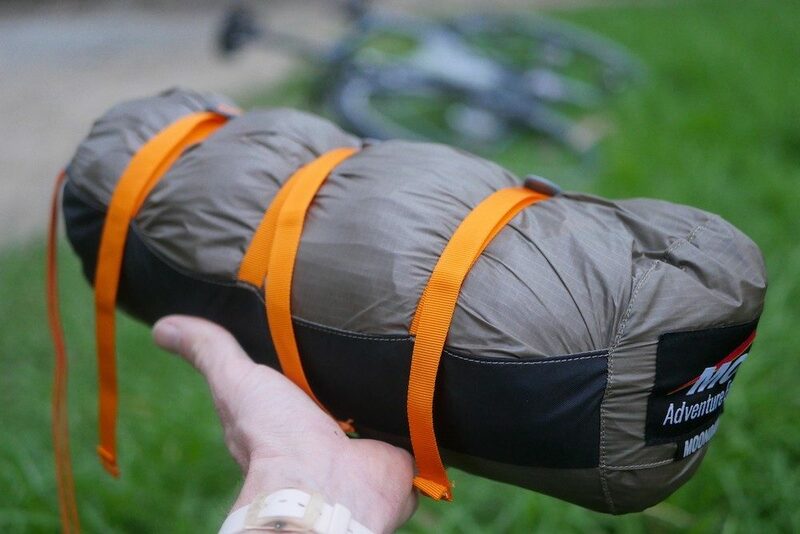 It packs into its neat triple-compression bag very easily. The pegs are light but also super space efficient. They tend to organise themselves together even when you don’t intend to pack them that way! 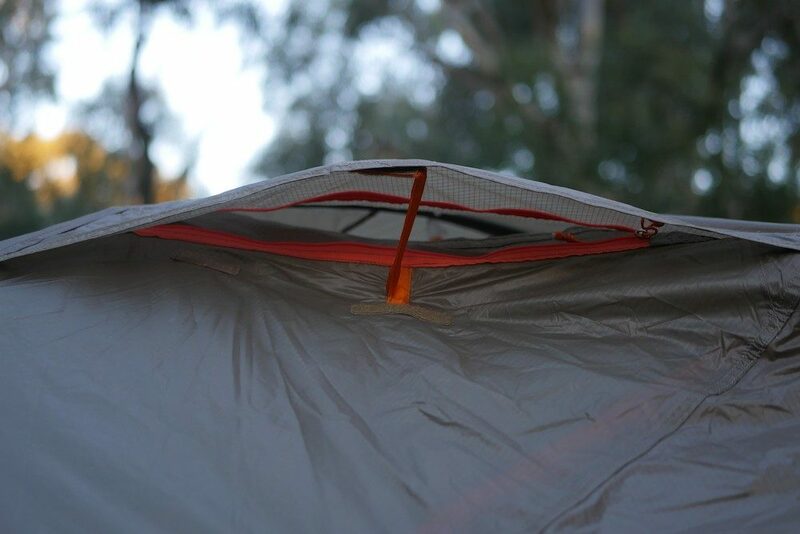 Like many modern freestanding tents, the Moondance uses pole ‘hubs’ on either end to achieve a higher degree of rigidity. 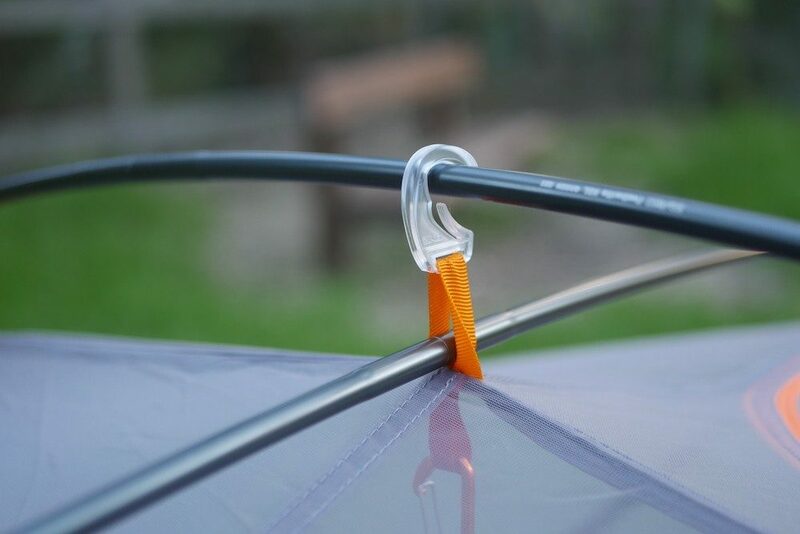 The pole clips are made by DAC and are very easy to clip on. Despite being made of plastic, they have a very solid feel and I, therefore, can’t see them failing. The poles are all DAC Featherlite aluminium. I can see these wearing out over time, but a full replacement pole set is available aftermarket for US $120. 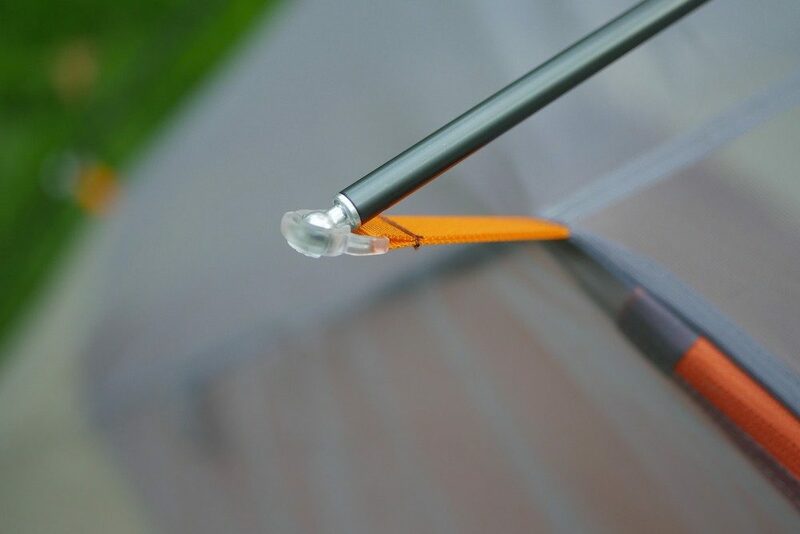 DAC ball-end clips quickly and easily attach above the tent doors. The fly is reinforced around the pole contact point above the door. There is a secondary clip that can further secure this section but I haven’t found it necessary. You can internally velcro the fly to the poles too, but again I haven’t found this necessary. On one side of the fly is a small roof vent. 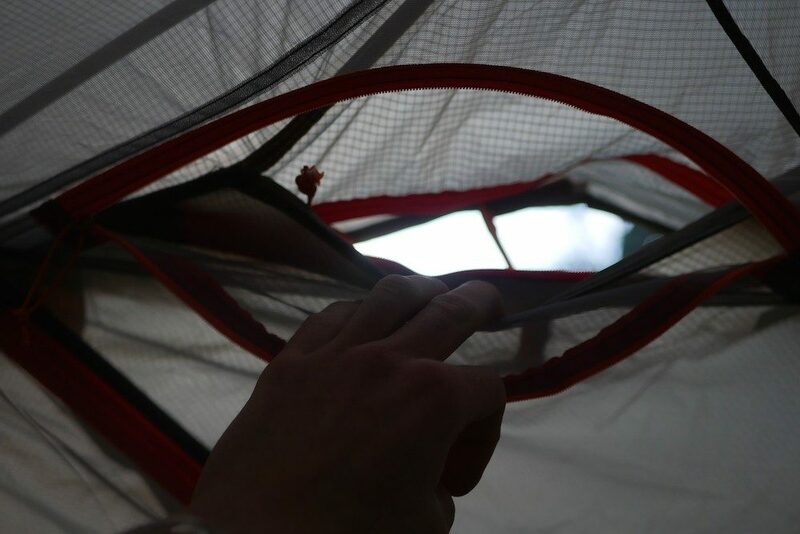 It is accessed via a zip on the tent inner. The roof vent is opened on the fly with a zip, and once open offers a large overlap to not let rain inside. A short rigid pole lifts from the bottom and velcros to the top to keep the vent open. The vent from the outside shows the recessed opening. The mouth-like opening is about 20cm across and 5cm tall in the middle. The tent poles are colour coded to assist with setup. This is because the tent is asymmetric, tapering from 130cm at your head down to 116cm at your feet. 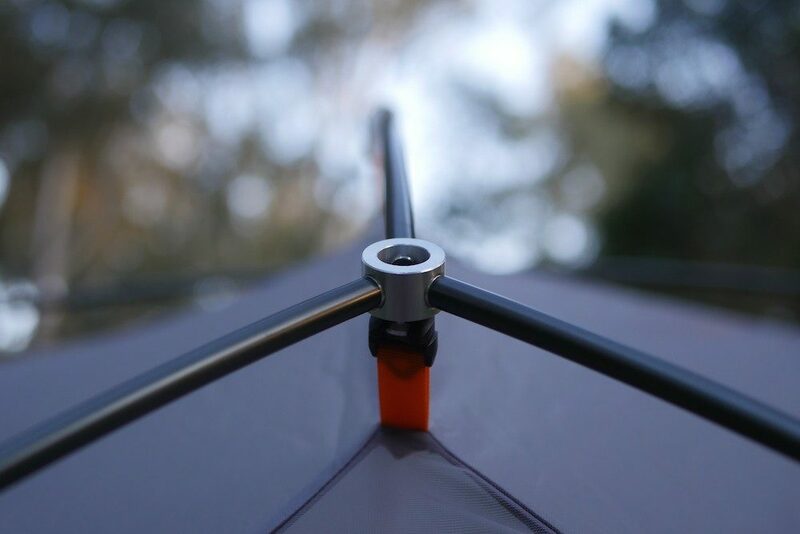 The three-point guy attachments stabilise the tent at the poles and the pole hub. 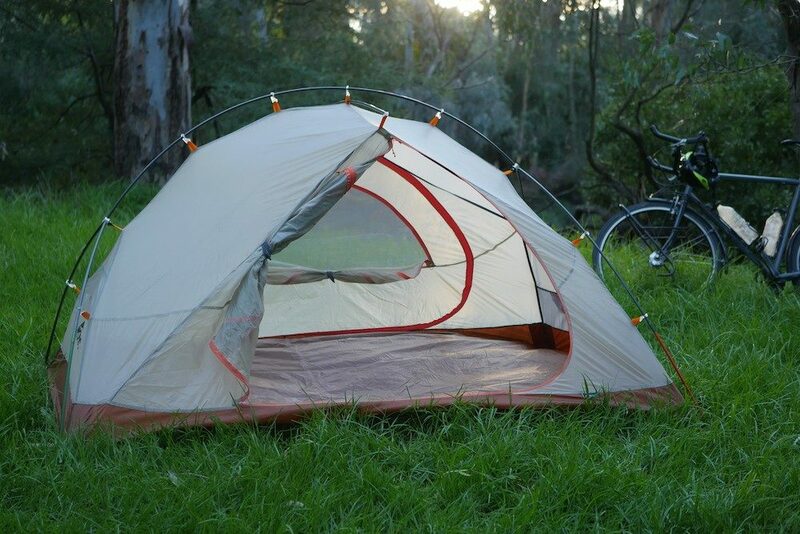 The Mont Moondance is a freestanding tent. 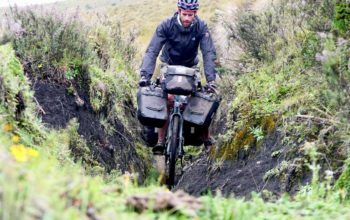 This is my preference for bicycle touring because they can be pitched without any staking, you can pitch the tent without the fly, they have great ventilation and they have a smaller overall footprint. Colour co-ordinated clips make pitching the Mont Moondance tent really easy. Your job is to remember is that the orange clips are where your head will rest, and you can then lay the inner in the orientation that suits. 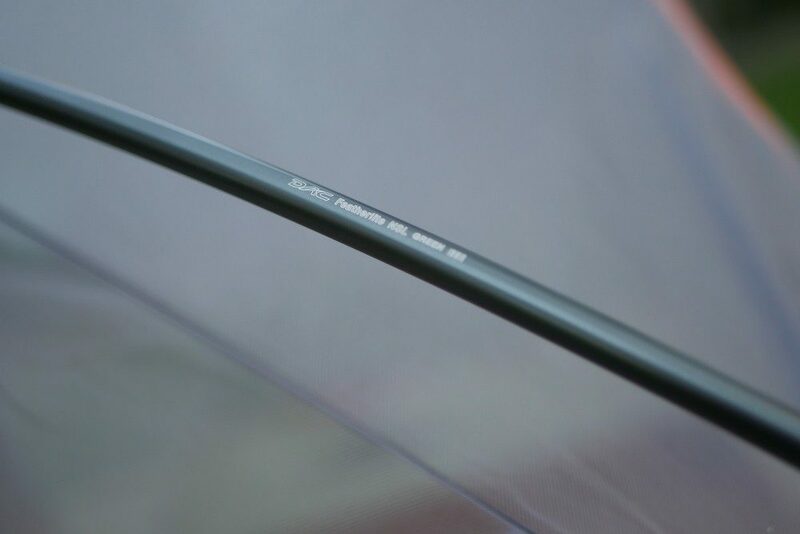 The poles snap together into the hubs to make the one-piece asymmetric frame. 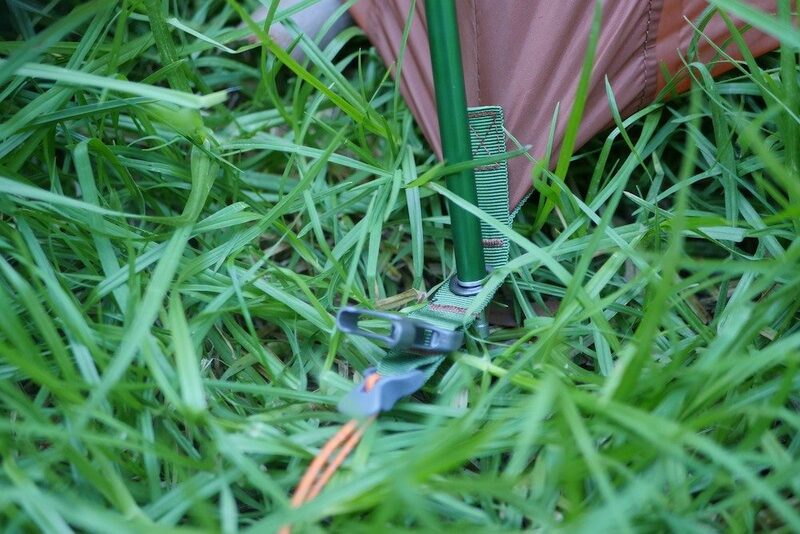 You can then match the coloured tent poles and coloured tent clips. It’s fine to put the poles in one at a time as they will stay in place without popping out. The clips and hubs on the inner are now ready to be hooked up to the poles, and finally, the ridge pole can be inserted on top. 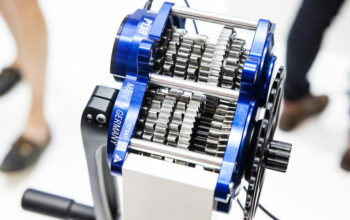 With the inner constructed, locate the coloured orange/green connectors on the fly and match them to the clips too. Stake out as much of the tent as you need, and should it be windy you may want to velcro the fly to the poles. These reinforcements will allow the guy ropes at the ends to better stabilise the tent in the wind. 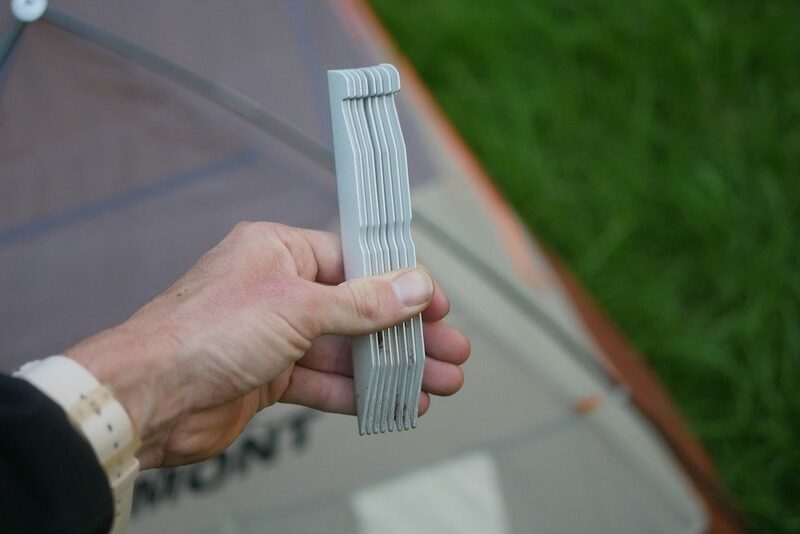 In an effort to drop the advertised weight, thick nylon floors are surprisingly uncommon amongst backpacking tents. The Mont Moondance tent is an exception here with one of the thickest floors I’ve come across on a sub-2000g tent. To make sure my previous tent floors survive the distance, I’ve always coupled them with groundsheets. 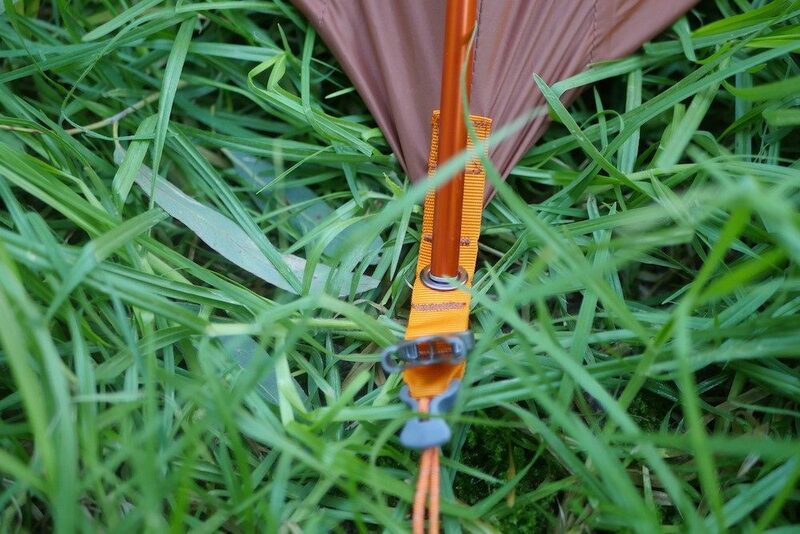 The thing is that groundsheets/footprints often weigh between 200-300 grams by themselves, which effectively brings lighter tents more in line with the weight of the Moondance. 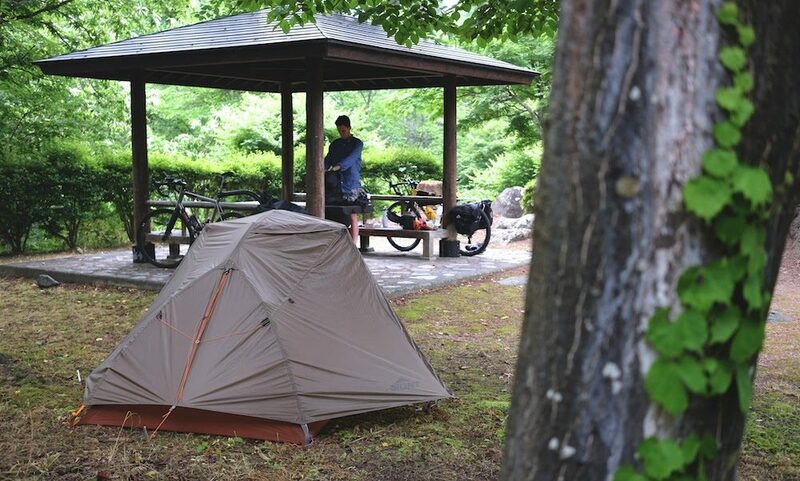 While there is a groundsheet option from Mont (around US $50), I don’t plan to use one because I feel confident the heavy-duty floor will last the distance. Not only is the floor tough, but I haven’t seen any water make its way up through the 10,000mm PU floor material. On a side note, Mont make a ‘3D footprint’ which is essentially a groundsheet with a 5-10cm wall that sits up around the edges. 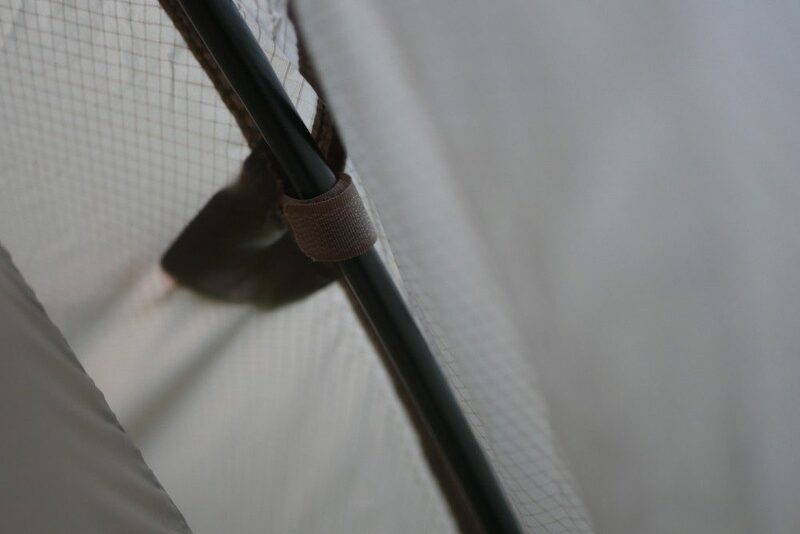 With the poles, fly and the 3D footprint you can have a pretty lightweight shelter that will prevent water ingress and creepy crawlies in your sleeping bag. A Mesh AND 4-Season Inner?! This bit is super neat. 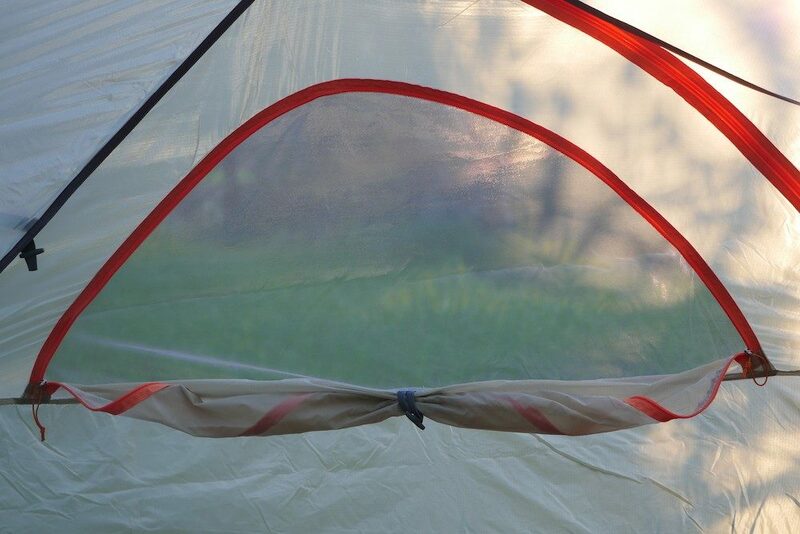 Mont produces two different tent inners depending on the season you’re camping in. 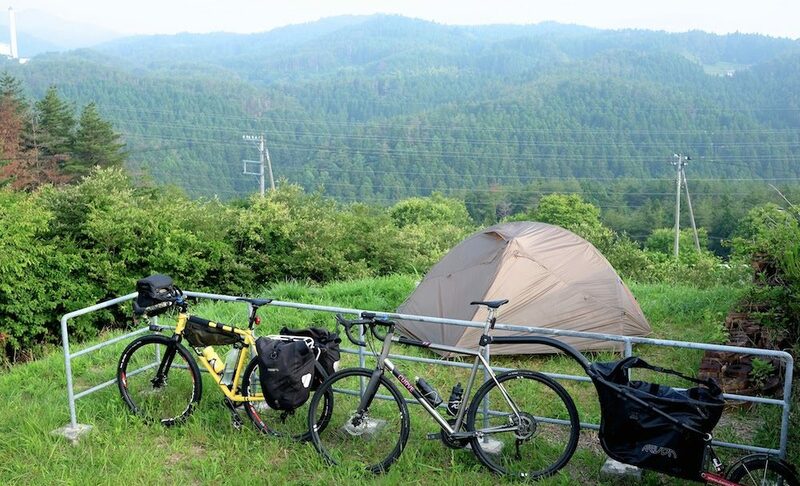 Buying a second inner isn’t cheap – it’s US $270, but that works out cheaper than a second tent of this calibre. 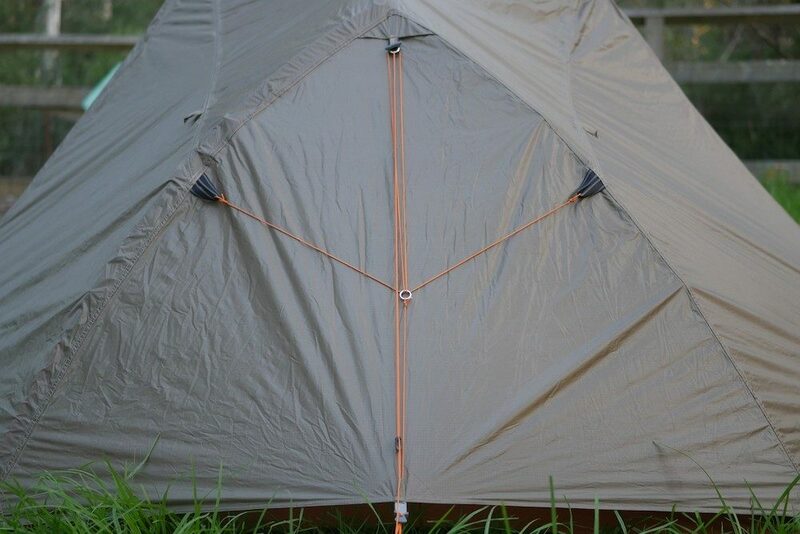 Both Mont Moondance tent inners share the same floor, pole clips, pockets and zips. The difference is the upper: the summer inner uses No-See-Um mesh to allow heat to escape, while the winter inner uses 20D nylon from the floor to the roof. The four-season inner is just 100 grams heavier and is what I’ve been using on trips with overnight temperatures below 10 degrees Celcius. The mesh inner offers the same floor but applies a breathable mesh for the roof section. 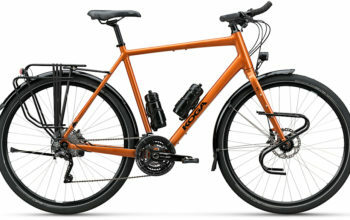 The four-seasons inner has a 20D nylon roof that traps more heat. There’s still the option to zip back the windows for warmer conditions. Looking through the No-See-Um mesh roof of the summer inner. Taking a look out of the zipped-back window of the four-season inner. The nylon inner in the late-afternoon sun. 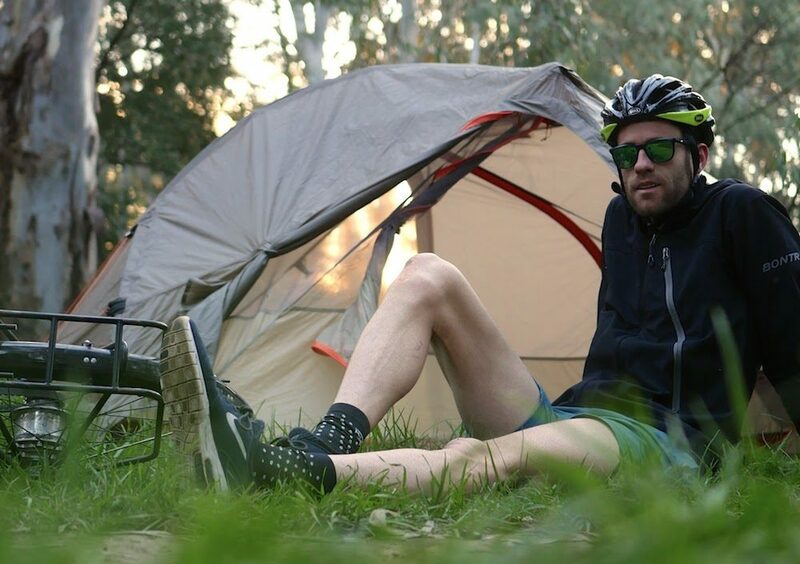 I’ve now experienced most weather conditions in the Mont Moondance tent, with the exception of some ultra-high winds and heavy snow… but I’ll get that while CyclingAbout The Americas. I’ve been really happy with how the tent has performed so far. 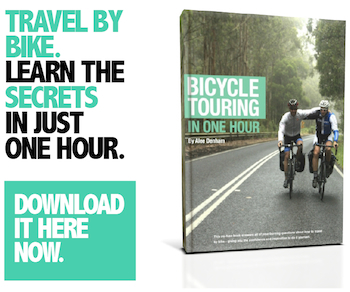 Everything from the pitch to the design, to the quality and finish appears to be top notch. Even with my two-metre body plus a friend, there’s ample room for sitting up inside in the tent. The dual doors are excellent for sneaking out at night for a quick whizz without waking your mate, and the fact the doors open really low means it’s easy to get in/out without shaking the tent. 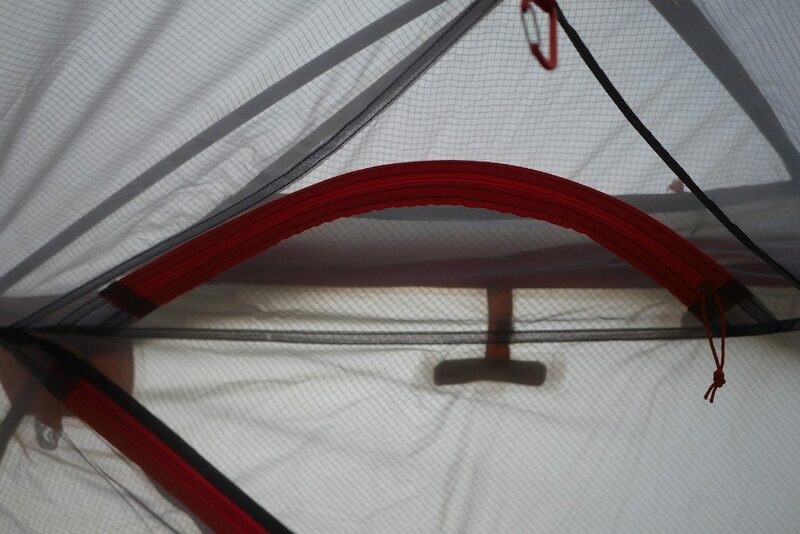 The tent seems to ventilate well and the shape of the tent has meant I’ve never had condensation drip inside. In freezing conditions, the condensation builds on the fly overnight so you’ll need to be careful when packing up the tent. Given I travel solo with a two-person tent (after all, one-person tents are not much smaller/lighter), I am afforded the luxury of having my gear inside my Mont Moondance tent for easy access. I also feel a bit better sleeping with all of my valuables by my side. 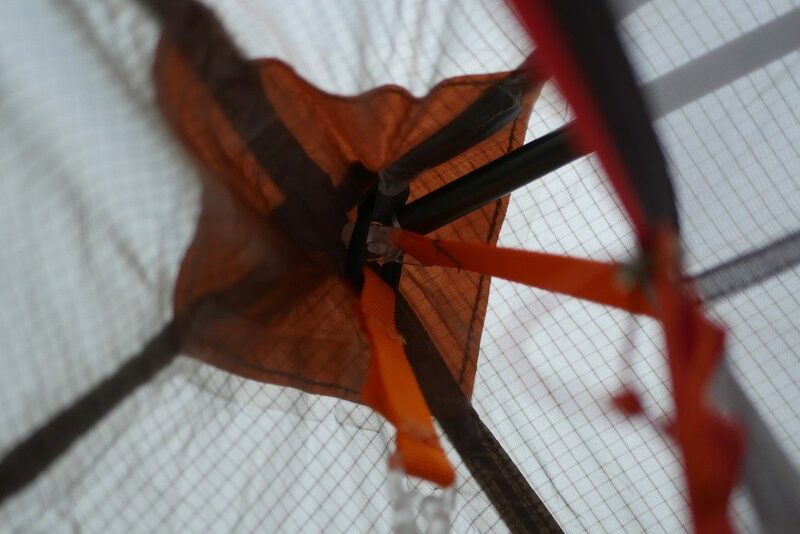 The Mont Moondance tent comes with a ‘care package’ including a pole repair sleeve, glue and some nylon for patching up any tears. Would I Recommend It To A Mate? Absolutely. The Mont Moondance tent is well-made and hardy. It ticks all of my boxes in terms of being freestanding, having a tough floor and using a dual entrance/vestibule. 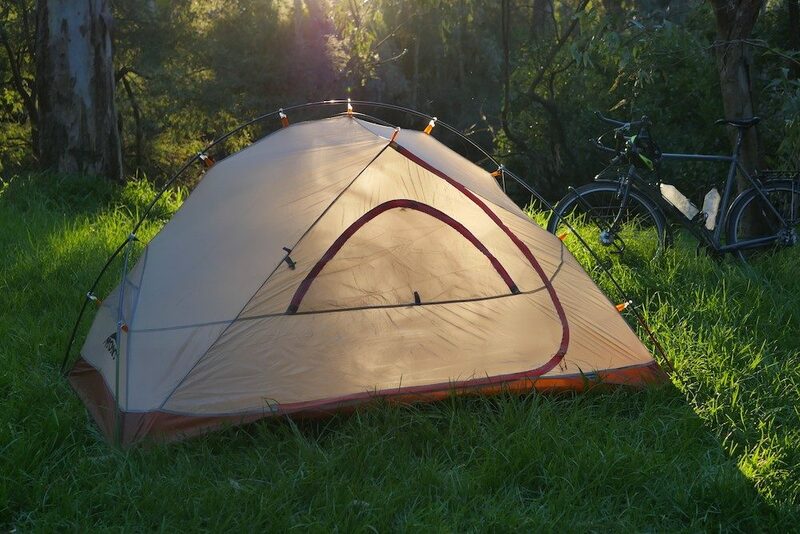 It is a touch on the pricey side at US $540, but I figure that if you use an expensive tent all the time they can be cheap on a per-night basis. 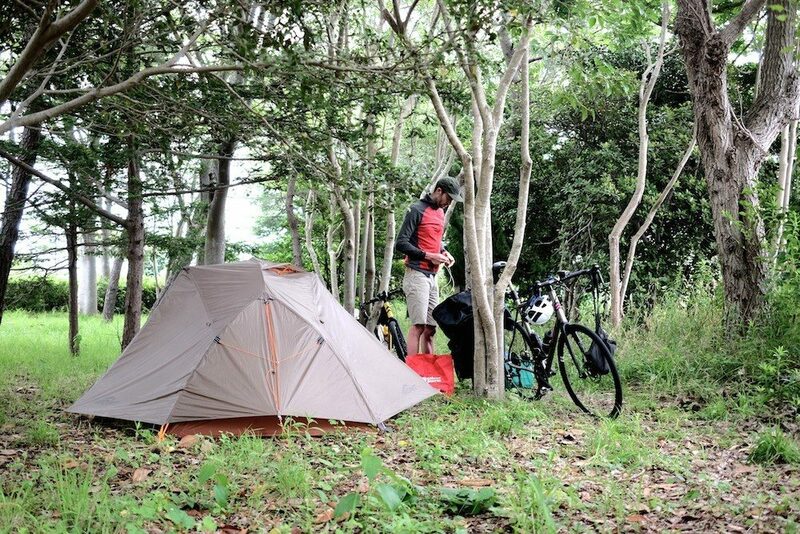 I’ve taken my Mont Moondance tent to Argentina with the four-season inner. 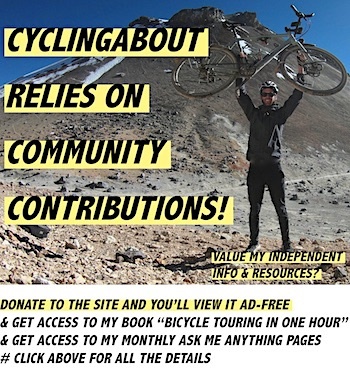 I am expecting overnight low temperatures between -20 and 10 degrees Celcius for the first eight months as I will be traversing the Andes by bike. When I reach Ecuador I will send my four-season inner back to Australia and will switch it to the mesh inner for Colombia and Central America. Depending on the weather in Canada and Alaska, I may need to swap the inners over one more time before I finish. Right, let me report back to you after another year or so of use/abuse.